TRA-Worcester ESOL Students Celebrated Presidents' Day With Historic Play | Training Resources of America, Inc.
On February 14, 2018, TRA-Worcester ESOL 3 students performed a play for fellow students in ESOL 1 and ESOL 2 classes. 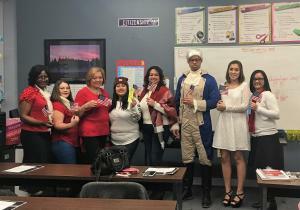 Taken from Celebrating American Heroes, Plays for Students of English by Anne Siebert, the play depicted how the American flag was made by Betsy Ross. Students in the audience were enthralled and felt the history lesson was easier to understand by watching the play, than reading from a book. ESOL 3 Instructor Teresa Barrett was the inspiration for and director of the play. Hector Mora played George Washington and Nayane Silva was Betsy Ross. Education and Career Advisor Cynthia Vlasaty recognized the group of thespians with TRA Star Award bookmarks. This event marked the first in a series of plays that ESOL 3 students plan to present this year. Pictured from left to right in the photo: Rose Bilonda, Arangelly Avarez, ESOL Instructor Teresa Barrett, Mirna Vicente, Maite Rodriguez, Hector Mora, Nayane Silva, and Natalie Baez.